Last Christmas I thought it was time that my wife had a digicam to replace her little used APS film elph. She doesn't use a camera very much but when she does she want's it to be simple to use, small enough to throw in her purse and cheap enough not to be too precious with it ... a little style would be a bonus. At the time it seemed that a lot of retailers were offering a deal on the X31 so with little outlay I bought a camera that filled her needs. 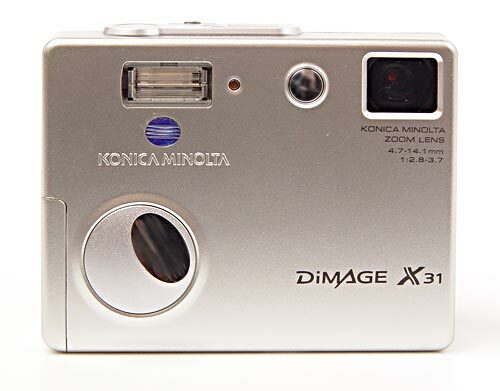 The X31 is a 3.2 megapixel, point and shoot, compact digicam that incorporates the unique 'folded' 3x optical zoom first offered in the DiMage X. The zoom lens is totally enclosed in the cameras sleek body and looks out of the top right of the camera via a mirror through a window in much the same way as a periscope. This design allows fast startup times and, with no delicate lens protruding from the camera's body, a very compact and relatively rugged design. The lens elements are all glass and equivalent to 36mm - 108mm in 35mm terms. The X31's styling and metal case belies its budget price tag and it looks much more expensive than its street price which was as low as $150 for the Christmas season of 2004. To make the camera for this low price certain compromises have been made; there is no optical viewfinder, no sound in movie mode and some reviewers have complained about noise and poor focusing in low light situations. The camera shoots in an automatic program mode at all times with no shutter or aperture priority settings. There is exposure compensation , white balance settings, etc available, however, if you are serious about your photography this camera probably won't fulfill your needs. 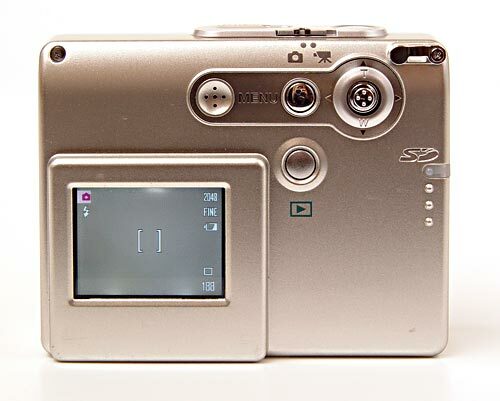 If you're looking for a cheap pocket or purse digicam when your SLR is too unwieldy the X31 might be worth considering. It also makes a great gift camera for anyone you want to give a stylish, automatic, small digicam to that will give competent results without the complexity of lots of manual settings. The X31 conveniently takes two regular AA batteries but I highly recommend the use of high capacity NHiM rechargeables as it can eat regular batteries. Also keep a spare set close at hand; one tip I have is not to carry those spare batteries loose in your change pocket. While at dinner with friends my jean pocket suddenly became very hot when the coins shorted out the batteries. In addition to the surprise it gave me I'm sure it did the batteries no good. I have carried this camera myself occasionally when I didn't want to carry a camera but I just might want to take a photo. If you're used to a 'prosumer' class of digicam it can be a little tricky to get the shot you want out of the X31. It really wants to be in its default mode which includes auto-flash which seems to want to fire even in decent sunlight. The joystick interface is a little fiddly (I hate this style of joystick pad that you have to push to select an option - unless I'm really careful the camera reads my push as an 'up' or 'right' - but that's just me). In the out of the box mode all settings that you've selected get set back to their defaults when you power the camera on and off. It took me a while to find the setting option that stops this from happening. It also took me a while to find the setting that allows you to choose what the left/right joystick axis will do in taking mode. By default it does nothing but I set it to change flash mode - I hate on-camera flashes but I need to be able to quickly set the X31's flash mode back to auto when I pass the camera back to my wife. I can see other situations where setting this axis to exposure compensation would also be useful. The X31 does hunt for focus a little especially in lower light situations. Due to its basic specifications there is no AF assistance so, even with the flash turned on, the camera may fail to get a focus lock in a dark restaurant; this can be frustrating when all you want to do is grab a snapshot. The camera has no separate macro-mode but seems to focus at 3 inches at all focal lengths. The lack of an optical viewfinder can also be frustrating especially in sunlight. The small LCD screen is adequate ... just. In such situations you need to develop a technique where you hold and control the camera with your right hand and cup the screen with your left as a makeshift LCD screen. It's easy to do and makes composing your shot much easier than squinting. Talking of holding this camera, I find it's best to just use my right hand to hold and control this camera. If you do try to steady the X31 with your left hand be aware that the taking lens is in the very top corner of the camera; it's all to easy to include your own fingers in the shot. I find it harder to get the shot I want out of the X31 than out of my more complicated cameras but with a little care and familiarity with the X31 it is possible. But this camera is not aimed at me. 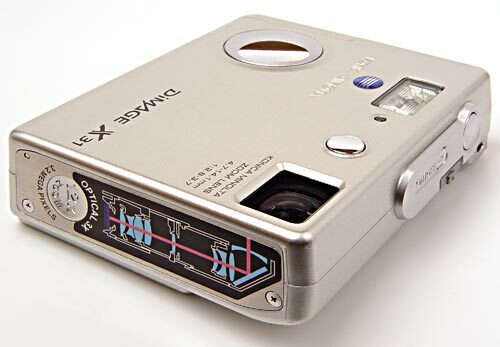 It is aimed at the casual user who just wants a convenient point and shoot. Certainly the shots are good enough for the web and small prints; with a lot of care 8x10s are possible too. Just don't expect too much from the X31 and you won't be disappointed. As usual with the Konica/Minolta brand you do get a lot of bang for your buck. For the price, it is a stylish bargain but if you're anything more than the most casual of photographers don't make the X31 your only camera. i have a minolta dimage Xt..
it was on cheap sell about the same time as you got your wives cam. mine includes sound on videos, the display is in the central middle of the cam and i have more buttons etc to control the camera. its a really nice one and i got it as a present and it was about the same price as yours. its horrible when i wanna shoot some of my friends or people and they think the photo is done, they just move a very bit (or just i need to move for milimeters) and the result is a mess so i have to ask them to do the same photo as well. nah, but interesting i found someone who noticed the same. i really thought (before this article) that i am too stupid for digital stuff.. haha.